Minerva Lue Henshaw1,2,3,4,5,6,7,8,9 [Lulu Henshaw10, Mary Henshaw11, Eugenia Hinshaw12,13]. Born May 17 18761,2,5,6,8,11,12,13 [about 187910, about 18787], Arkansas1,2,5,6,8,11,12,13. She married Gilbert Materson Gay1,2,9 [Gilbert Madison Gay3, Gilbert Matt Gay14,15,16,17, Matthew G. Gay11, M. Gilbert Gay10], Aug 12 18971,2,9, Nevada County, Arkansas1,2,9. Gilbert, son of Francis Marion Gay & Mary Abbie Allen1,2,7,8,11,18,19, was born Mar 20 18751,2,7,8,11,18,19 [Mar 20 187516,17, Mar 29 187514,15, about 187610], Alabama1,2,7,8,11,18,19 [Georgia10,14,15,16,17]. M. Mary / Minnie B. / Fannie Gay, born May 1899, Arkansas; married -- Banks. Marion Gay, born c1902, Arkansas. Albert Gay, born c1905, Arkansas. Luetta/Lou E. Gay, born c1909, Arkansas. Othel? Gay, born c1912, Arkansas. Lov[??] Gay, daughter, born c1914, Arkansas. Paul Gay, born 1919, Arkansas. Gay, Frank, head-of-household, age 50, born Apr 1850 in Georgia; parents born in Georgia; widower; occupation: farmer; owned farm (free); cannot read or write. Gay, Matthew G., son, age 25, born Mar 1875 in Alabama; parents born in Georgia; married 2 years; occupation: farmer; rented farm. Gay, Rosie E., daughter, age 16, born Mar 1884 in Alabama; parents born in Georgia. Gay, Moses F., son, age 14, born Feb 1886 in Texas; parents born in Georgia; occupation: farm laborer. Gay, Mary G., daughter-in-law, age 24, born May 1876 in Arkansas; parents born in Arkansas; married 2 years; 1 child, 1 living; cannot read or write. Gay, Fannie, daughter, age 1, born May 1899 in Arkansas; father born in Alabama; mother born in Arkansas. Gay, M. Gilbert, head-of-household, age 34, born in Georgia; parents born in Georgia; first marriage, married 13 years. Gay, Lulu, wife, age 31, born in Arkansas; parents born in Arkansas; first marriage, married 13 years; 6 children, 5 living. Gay, M. Mary, daughter, age 10, born in Arkansas; father born in Georgia; mother born in Arkansas. Gay, Marion, daughter, age 8, born in Arkansas; father born in Georgia; mother born in Arkansas. Gay, Nettie, daughter, age 6, born in Arkansas; father born in Georgia; mother born in Arkansas. Gay, Albert, son, age 4, born in Arkansas; father born in Georgia; mother born in Arkansas. Gay, Luetta [unclear], daughter, age 1 [unclear], born in Arkansas; father born in Georgia; mother born in Arkansas. Gay, Gilbert M., head-of-household, age 44, born in Alabama; parents born in Georgia; rented home; occupation: carpenter. Gay, Minervia, wife, age 42, born in Arkansas; parents born in Arkansas. Banks [unclear], Minnie B., daughter, age 20, born in Arkansas; parents born in Arkansas [sic]; [..marital status unclear - appears to show married or widowed..]. Gay, Nellie, daughter, age 16, born in Arkansas; parents born in Arkansas [sic]. Gay, Albert, son, age 15, born in Arkansas; parents born in Arkansas [sic]. Gay, Lou E., daughter, age 10, born in Arkansas; parents born in Arkansas [sic]. 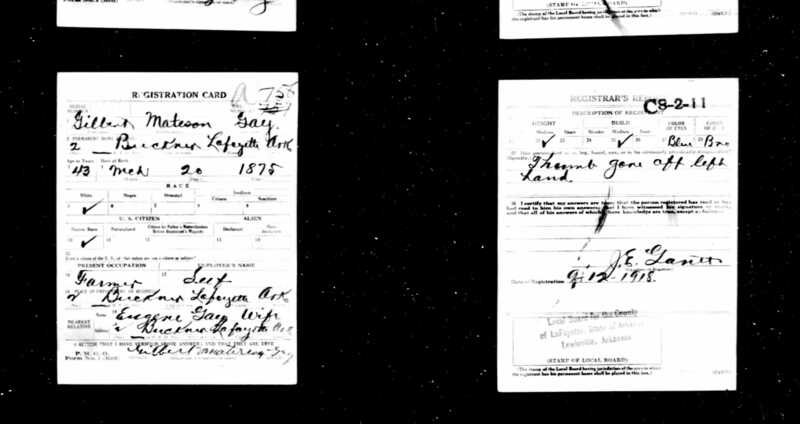 Gay, Othel [unclear], son, age 8 [unclear], born in Arkansas; parents born in Arkansas [sic]. Gay, Lovel[..unclear..], daughter, age 6, born in Arkansas; parents born in Arkansas [sic]. Gay, Paul, son, age 2, born in Arkansas; parents born in Arkansas [sic]. Gay, Gilbert M., head-of-household, age 55, born in Alabama; parents born in Alabama; first married at age 22; rented home ($10 rent); no radio in home; occupation: carpenter; not a war veteran. Gay, Minerva, wife, age 52, born in Arkansas; parents born in Arkansas; first married at age 21. Gay, Paul, son, age 13 years 2 months, born in Arkansas; father born in Alabama; mother born in Arkansas; attended school. RootsWeb WorldConnect data by (). RootsWeb WorldConnect data by Cathi Henning (). 1920 census, Hadley Township, LaFayette County, Arkansas; roll T624-68, ED 116, page 13A, line #39, dwelling #120, family #120. 1930 census, Seminole, Seminole County, Oklahoma; roll T626-1931, ED 26, page 33B, line #89, dwelling #791, family #977. 1910 census, Calhoun Township, Columbia County, Arkansas; roll T624-46, ED 62, page 67B, line #54, dwelling #191, family #191. 1900 census, Parker Township, Nevada County, Arkansas; roll T623-69, ED 85, page 4B, line #78, dwelling #70, family #70. Contribution from C. Elton Hinshaw. 1880 census, Missouri Township, Nevada County, Arkansas; roll T9-0052, ED 213, page 482D, line #18, family #335. RootsWeb WorldConnect data by Elaine Hendricks (). RootsWeb WorldConnect data by Brad Aycock (). RootsWeb WorldConnect data by Peggy J Gilbert (). RootsWeb WorldConnect data by Peggy Shaw (). 1880 census, Abernathy, Cleburne County, Alabama; roll T9-8, ED 44, page 200D, line #37, dwelling #248, family #250. Burials in Garland Cemetery, Haskell County, Oklahoma; USGenWeb Archives.